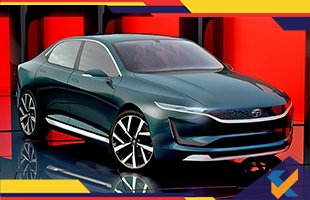 Tata celebrated its 20th consecutive year of participation in the Geneva Motor Show by giving us the first look to its latest car, the EVision Sedan. The concept of the EVision was on display at the Geneva Motor show and it showcases a sleek and classy design. This car runs on an electric system and has a catchy design. This car is styled to Tata’s latest Impact Design 2.0 design language. This has resulted in a very drastic change in design preference and pattern compared to previous cars launched by Tata. The front of the car has slim LED Headlamps that share some similarity with the 45X Hatchback. These headlamps merge well with the grille which has a brushed aluminium effect on it. Moving to the back part of the EVision Sedan, it does not have a traditional 3 box sedan setup. Instead it has a fastback like shape with an accessible boot. It has four 21 inch wheels. The solidity and stability of the design is supported by a broad C pillar and bold and prominent shoulder line. The roof of the car merges smoothly with its tail which showcases as a sleek design element. Other notable design elements of the car include its flush fitting door handles, neatly sculptured outside mirrors and the use of aluminium for the top of the windows and base of the doors. The aluminium at the base of the rear bumper also adds to the beauty of the rear of the car along with sleek taillights. The design of this car is unique and of high standard. The standard can trick you to believe that this car has been designed by a popular European car manufacturer. The interior has a premium look and feel to it and this is because majority of the cabin is made of high quality wood. The color of the interior is towards the lighter shade which helps the impression of spaciousness. It also has a floating dashboard that extends to the floor. The entire EV setup has allowed to Tata to maximise cabin room and Tata claims that they taken this point into considwrsation when designing the car. This car is arguably the first car that has exploited the advantage of having an electric setup instead of a regular petrol engine when maximising cabin room and enhancing interior features while having a classy exterior. The dashboard is also minimal and size and has a creative element which is a retractable screen that remains hidden in the dash when not in use. This car has rear seates that are fully adjustable and ensure large headroom and legroom adding to the experience of the passenger inside the car. Some of the performance highlights of this car include a acceleration time of under 7 seconds to go from 0 to 100kmph. The maximum speed of this car is a whopping 200kmph. This car has a set of creative technological features such as Predictive Energy Management systems collaborated live traffic and routes, ADAS features, slow and fast charging options, cloud computing and more. All in all, it’s a car that has shown us whole new different side of Tata and consists of many unique features which will enhance the standard of an electric car.